I always have mint growing in my garden and so it really is a doddle to make this mint sauce. We were given 4 beautiful lamb chops which came from the Karoo. The Karoo is a desert region of South Africa where lamb are bred. They are supposed to be excellent as the lamb have to walk far and wide to forage for their food. Our friend Alex had been up there for a shooting of a movie and had come back with a freezer full of chops. Dave decided to light a braai (barbecue) and use one of the gifts I gave him for our wedding anniversary. I decided that if Dave was going to braai lamb, I was going to make mint sauce. In my mind, this is one of the easiest sauces to make – and nothing beats home made in my opinion. It will keep, so when your garden mint is abundant do make some and then you will have it in your fridge for the long cold winter, when cooked lamb and mint sauce will go down a treat. We always have mint over the summer, we need to get on the ball and make this! It was always my duty to make the mint sauce when I was a young girl and I remember choosing each mint leaf one by one – not sure why seeing that they all got chopped up. 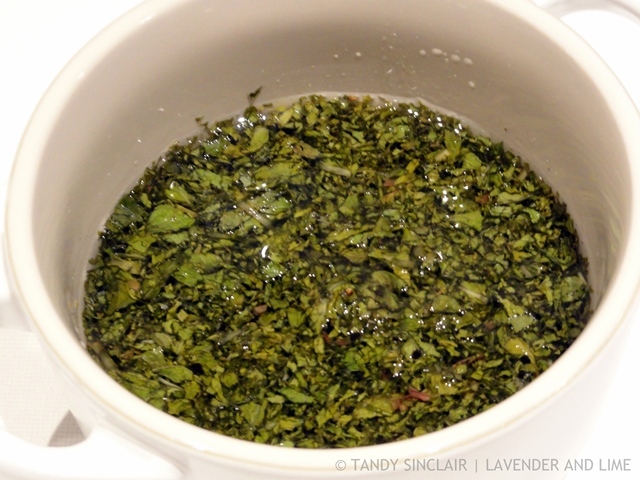 I love mint sauce – can´t believe that I have never made it here. More fool me! The mint sauce sound fabulous Tandy.